Here in St. Augustine, our Nation's Oldest European-founded city, the interiors of the Castillo de San Marcos and Fort Matanzas remain CLOSED by edict of President DONALD JOHN TRUMP. The Castillo is our largest tourist attraction. Its being closed damages our tourist economy here in our Nation's Oldest City. Last year, I asked Governor RICHARD LYNN SCOTT and local government officials about procedures to help keep the Castillo and Fort Matanzas open, including a small amount of state funds, as elsewhere (preferably bed tax funds, paid by tourists). 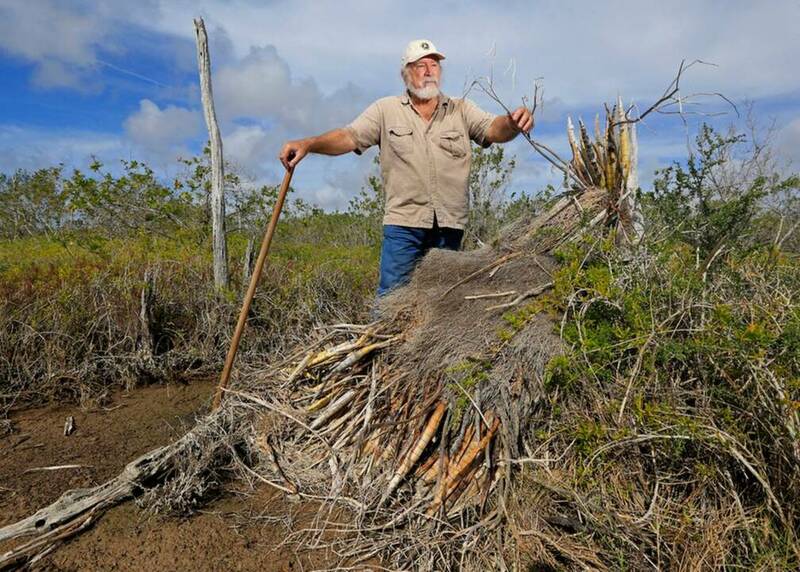 Botanist, Roger Hammer gives a brief tour of a trail blocked by fallen trees and a saltwater marsh with damage done to a large Cowhorn Orchid knocked over by high winds from Hurricane Irma at Everglades National Park on Jan. 23, 2018. At Everglades National Park, one of the most visited in the nation, “the parks are open, the concessions are operating and the Everglades Association is staffing visitor centers,” South Florida National Parks Trust executive director Don Finefrock said in an email. During the last government shutdown in 2016, visitors’ centers at the parks were closed. This year, the government allowed them to remain open as long as they don’t use government resources or personnel. Sutton said his nearly 60 plain-clothed employees are emptying out trash cans, cleaning bathrooms and staffing the Oasis Visitor Center in Big Cypress National Preserve off Tamiami Trail. At the visitor center, employees are pointing tourists toward the available tours, an important link for the private businesses that rely on rangers to send customers their way. The winter season is traditionally the busiest season for tourists in South Florida, and the shutdown has slowed traffic to several of the parks, tour operators said. This is another blow for the same industry badly hurt by Hurricane Irma in late 2017. In Big Cypress, Steven Markley of Captain Steve’s Buggy Tours said he’s still feeling the financial pain from Irma, and the slowdown from the shutdown hasn’t helped. Whenever there’s a shutdown, he said, tourists assume the park is closed and stay away. Finefrock, with South Florida National Parks Trust, said he worries about the impact a prolonged shutdown could have on park resources and staff morale. Educational programs that the trust funds depend on seasonal staff, “many of whom can’t afford to go without a paycheck. If those seasonals give up and go home, the parks will have to cut programming, even after the government reopens,” he said. As the shutdown continues, some visitors have taken it upon themselves to clean up the parks and preserves. Alex Rubinsteyn, a 35-year-old medical researcher from New York, was hiking Gator Hoof Trail with his girlfriend Geddes Levenson on Monday when they noticed the parking area was covered in trash. The couple found a roll of dog poop bags in their car and gathered as much garbage as they could that day. They plan to return this weekend for a more thorough cleanup with some friends. For tour operators in other parks, the shutdown hasn’t changed much. That’s especially true in the Dry Tortugas National Park off the Florida Keys, where only one island is open. Tourists must arrive by ferry or seaplane, thanks to its location about 70 miles from Key West. Terry Strickland, the general manager of the Yankee Freedom ferry tours to the Dry Tortugas, said his staff is already the cleanup crew for the island, Garden Key, and his boat is usually booked to capacity weeks in advance. Cyclists ride their bikes in Shark Valley in Everglades National Park.